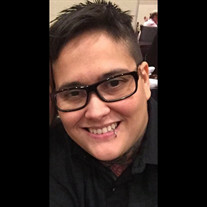 Sarith M. Narro, 41, entered eternal rest on Monday, April 9, 2018 in Kyle, Texas. Sarith was born on February 2, 1977 in McAllen to Benito and Margot Narro. Sarith attended Our Lady of Sorrows School from Kinder thru eighth grade, was a 1995 graduate of McAllen Memorial High School, where she excelled in her studies and sports (basketball) and graduated from UT Pan American. Sarith was a long time resident of McAllen and also lived in Austin for some time. Sarith enjoyed making people laugh and very easy going to all she came in contact with. Sarith had a HUGE heart for animals. She believed that all animals have souls and that they should be treated with love and care. Sarith truly enjoyed and lived her life to her fullest. Sarith loved her family with all her heart mind and soul. Sarith will forever live in our hearts and memories. Sarith will be dearly missed but never forgotten. Left to cherish her memory are her parents: Benito and Margot Narro; her brothers: Louis and James Michael Narro; her maternal grandmother: Maria Socorro Potter; extended nieces, nephews, aunts, uncles, cousins and friends. A gathering of family and friends will take place on Saturday, April 14, 2018 at Rivera Funeral Home from 3-9 PM with a Holy Rosary to follow.